By opening the Maghreb Building, a comprehensive leisure complex, in March 1990, Yunika pioneered an entirely new type of management and operations for tenant buildings. 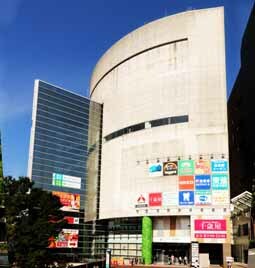 Located in Tokyo's Tama Ward, the complex features a community-based mix of tenants made up primarily of outlets owned and operated by Yunika. From the start, the Maghreb Building has been a major attraction in the Tama area, drawing crowds of reliable repeat customers. The Maghreb Building was recognized by the Tama Electricity Association for its achievements in reducing electricity consumption through the rationalization of electricity usage, which included the promotion of efficient power consumption and improvements in electrical efficiency. At the Maghreb Building, Yunika succeeded in reducing CO2 emissions by 16% in fiscal 2010, well above the mandated emission reductions of 8% based on the Tokyo government’s strengthened environmental regulations for large buildings. Yunika reduced the emissions by upgrading air conditioning equipment and other measures to improve energy efficiency. Yunika plans to continue pursuing proactive measures for reducing CO2 emissions in the future.